Well, I don’t have any photos today because my sister is using the camera for a project, but I do have progress to report – the Silk Garden cardi is done and currently taking a bath, and the second red sock is up past the heel turn. Pictures tomorrow. So naturally, I’m thinking about new projects. I’ve also decided to make “Sideways Spencer” (sooner rather than later) by Annie Modesitt, from the Fall 2004 IK – damn, that was a good issue! I’ll use some modifications a la Bonne Marie, and I’m going to do it in Cotton Fleece, in an olive colour that doesn’t seem to be listed on their website. Here’s the thing – I’ve had the 6 remaining skeins at the store put aside for me, but I’m worried that it won’t be enough. 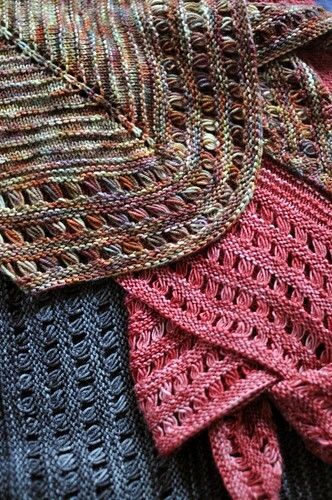 The pattern calls for the equivalent of 5 skeins, and I’ll be adding quite a bit of length. I might hold off until we get a new order of Cotton Fleece, and that way I’ll be sure to have enough.